Four-line accessory handset is designed for use with AT&T Four-Line Corded/Cordless Small Business System with Extendable Range and displays four lines. Design includes push-to-talk speakerphone and 50 name/number Caller ID history, 100 name/number phonebook directory, volume control, ringer volume control, low battery indicator, intercom, mute, redial, hold function and 10-name redial. 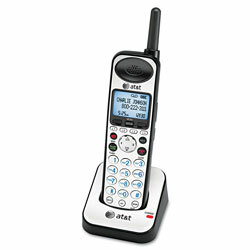 Black, Silver Single Line Cordless Telephones from Advanced American Telephone! 73 In Stock today.